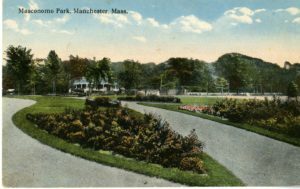 Manchester has gone through a series of name changes throughout its history: Naumkeag (later renamed Salem) – when our town was still part of that colony; Jeffrey’s Creek (or Jeffries’ Creek) – the 400 acres of land were originally deeded in 1636; Manchester – when the General Court approved its incorporation in 1645; and finally Manchester-by-the-Sea, which was officially adopted in 1990. So who was Jeffrey? Historians are confused about where William Jeffrey’s first settled in New England. Isaac M. Marshall, in his “Historical Manchester Papers”, connects a “William Jeffries” to the Dorchester Company that arrived in 1623. ‘He came to this vicinity and built a cabin somewhere along our river front, probably near the headwaters which they called a creek instead of a river, and probably a more appropriate name at the time’. However, no records show that a William Jeffreys (or Jeffries) had any ownership of land here. 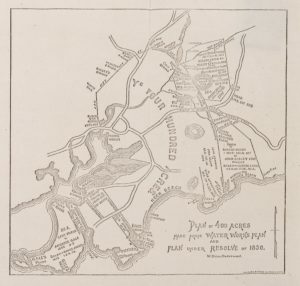 Historian Joseph Felt claimed that a William Jeffreys settled in Agawam (Ipswich), where he owned Jeffrey’s Neck in Ipswich and may have travelled through our town. Today there is no creek named “Jeffrey’s Creek” within the limits of Manchester, nor has this name been noted on records or deeds since the earliest days of Manchester. 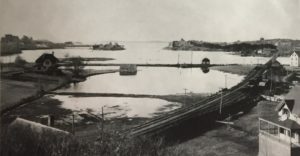 It appears that this “creek” is what was later referred to as the “River.” Dredging transformed a muddy tidal marsh creek into our beautiful harbor. The geography of landforms often defines their history; this was especially true with Manchester. At the time of its settlement, Manchester’s coastline was narrow and rocky and had numerous small bays and inlets. There was no major river suitable for extensive navigation, and the land, with the exception of swamp and marsh, was very heavily wooded. 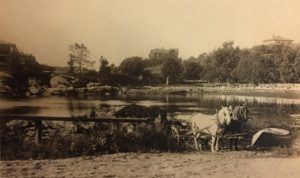 The salt marshes provided salt hay for fodder and bedding for horses while “Sea Manure” (seaweed) was harvested as fertilizer for gardens. It was this salt marsh (only navigable during high tide) that kept fishing a purely local industry. 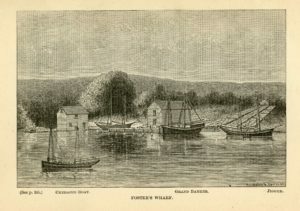 Manchester’s fishing industry served as a primary livelihood for many early settlers; they built weirs to trap fish and handlined or used trawl lines from Chebacco boats built in Essex. Fishermen caught cod, hake, haddock, halibut, pollock, eels, and lobsters. One of the oldest known public landings was recorded in 1684 at Smith’s Point. Public landings were behind today’s Town Hall, below Smith’s Farm on Proctor Street, on the back side of “The Island” off Proctor Street, at the channel at Tuck’s Point and Black Cove (Stinky Beach), as well as at Kettle Cove. Through the centuries, “The Island” was owned and named after a number of people such as the Lee, Smith, and Read families (in chronological order). It is no longer an island since being connected by a causeway to Proctor Street. During the 1870s, it was part of the summer colony for artists on Smith’s Point. A public landing to the south has been servicing the town since the eighteenth century. Despite its lack of depth, Manchester’s “river” provided resources for a number of industries. Until the 1894 dredging, navigation to the head of what we now call the “harbor” was possible only at high tide. At low tide, fishing and trade vessels were grounded in the mudflats until the next high tide. Also affected by the tide were gundalows, broad, very shallow, scow-like crafts propelled by two oarsmen and one sail that carried cargo during high tides. However, like other boats, they, too, had to wait during low tide when they bottomed out in the mud. The changing tides often produced challenges, but they also supplied power to gristmills and sawmills. By 1816, according to Lamson’s “History of Manchester,” the town had 3 gristmills, 3 lumber mills, 1 mahogany manufacturing shop, 1 bakery, 12 carpenters, 1 cooper, 1 wheelwright, 3 painters, 1 tailor, 1 brickyard, 2 blacksmiths, 6 shoemakers, 1 manufacturer of ships’ steering wheels, 1 tannery, and 10 furniture shops. 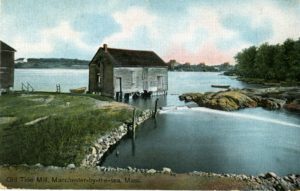 Cyrus Dodge’s furniture mill was built in 1845 on a stone dam north of Marsh Island/Day’s Creek, opposite Masconomo Park. It later was the site of one of John Perry Allen’s mills, which burned in 1851. Rust and Marshall’s furniture mill stood at the current site of Seaside #1. The earliest sawmill at that site dated back to 1644. Rust and Marshall took over the location after the fire of 1836 destroyed another of John Perry Allen’s mills. Easkot’s (or Eskot’s) mill at Chubbs Creek was another tidal mill where the train trestle/drawbridge is today. 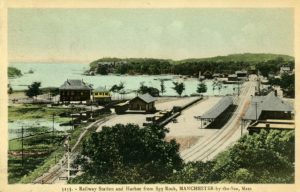 In 1847, railroad tracks were laid to Manchester. With the addition of the train causeway, the Inner Harbor was created, thus separating the two parts of the harbor. Building the causeway required drilling and blasting, horses and wagons, and scores of Irish men wielding picks and shovels. coming of the train tracks and station. A causeway with a wooden bridge was constructed in 1873 between the railroad tracks and Masconomo Street. In 1888, a stone arch was erected over the creek to replace the wooden bridge. The second track was laid in 1893, and three years later, the double-track drawbridge replaced the single-track bridge. Knight’s Wharf (now known as Peele House Square) was the location of Samuel K. Knight’s coal and lumber business established in 1873. Previously, Thomas Kitfield ran a business on the site. In 1895, Knight’s business became so extensive that he expanded his wharf. The site was convenient to the harbor for flat-bottom barges to unload supplies during high tide. That same year, one barge delivery did not go as planned. An arriving barge grounded in the inner harbor on an ebbing tide. Much of the cargo was transferred to a vessel before low tide when the barge split open and dumped the remaining contents into the harbor. After the railroad track was laid through Manchester, a spur track was built to the yard for unloading supplies arriving on trains. Following the Civil War, Manchester began reflecting a “Gilded Age” period with the building of many summer estates. During this time, the harbor was adorned with a number of what would become well-known landmarks. Tuck’s Point, named after Captain William Tuck, Revolutionary War hero, was established in 1895. The land was bought by the town from the Reverend Cyrus Bartol for $5,000, with an additional piece purchased for $4,100. Already on Tuck’s Point was the original Chowder House built in the 1880s. It was moved in 1895 when the harbor view was blocked by the newly built Manchester Yacht Club in 1892. The yacht club was designed by Manchester native Ernest M. A. Machado, an architect living in Salem. The Rotunda, designed by E. A. P. Luscomb of Boston, was built by Roberts and Hoare in 1896. The Tappan Marsh and mudflats area was purchased by the town in 1903 for $19,300. Five years later, this area was officially named after the Native American leader of this region who greeted Governor Winthrop and the Puritans when they arrived on the Arbella—an event portrayed on the Manchester town seal. In 1910, the Olmsted firm was hired to plan the park, but those plans were only partially implemented. Reverend Cyrus Bartol was a minister from Cambridge, Massachusetts, who fell in love with Manchester and became its first land developer. In the 1870s–80s, he bought most of Tuck’s Point, Norton’s Point, Smith’s Point, and Gale’s Point. 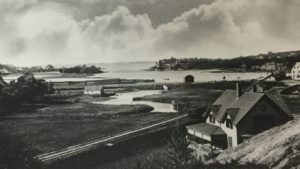 Bartol built a number of summer homes along the harbor to rent or sell for profit, including the Fort House, the River House, and the Moorings on Norton’s Point, as well as cottages on Gale’s Point. 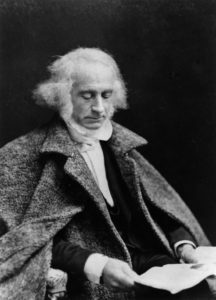 Bartol built and deeded his home, “Eaglis,” on Gale’s Point to his daughter Elizabeth (Betsy) with hopes that she would marry, thus the property was later called Betsy’s Inducement. However, Betsy never married and later sold the magnificent home. Bartol also built a three-story shingle-style home and an observation tower at Glasshead, located on Tuck’s Point. Little information is known about the first dredging project in Manchester Harbor. 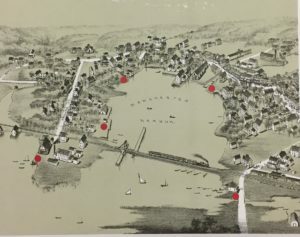 According to an 1884 Manchester Cricket Article, a survey of the harbor taken that year determined the dredging would extend from Point Rocks to Knight’s Wharf at an initial budget of $2,500. Work would begin in the spring, with the blasting to create a channel width of 60 feet. Subsequent dredging would result in mounting costs shouldered by the town, state and federal governments. Between 1887 and 1903, the cost of dredging by the federal government was approximately $9,500. Starting in 1907, the town began to take on a minimal cost of the various dredging projects made to the Main Channel up through the 1930s. A Special Town Meeting held on July 16, 1940, reviewed Mrs. Agnes Allen’s claims of rights to the mudflats behind Town Hall. Completion of the dike and dredging inside the drawbridge could not proceed until this ownership was resolved. The Land Court was in no position to say if the town of Manchester or Mrs. Allen owned the mudflats. The two parties eventually agreed, through a very complicated legal process, to pay Mrs. Allen $1,500 for the purchase of all rights, title, and interest in flats and water rights owned or controlled. As the shape of Manchester Harbor changed during the late nineteenth century, the industries along the harbor began to evolve as necessary. A town once regarded for its commercial boat making began to gain a reputation for its maritime recreation. Yachting soon became a favorite pastime of the town’s summer residents. 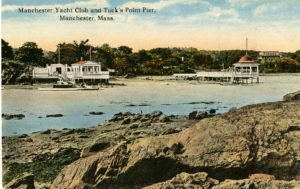 In 1875, an estimated 60 dories and 16 yachts were in Manchester Harbor; by 1904, the Manchester Yacht club had listed a registered 81 yachts in use. With yachting in high demand, there came a new type of business to fulfill the needs of this new pastime. 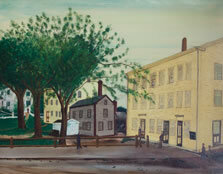 In 1895, David Fenton and Timothy White became the partners of the town’s first boatyard, located on 17 Ashland Avenue. 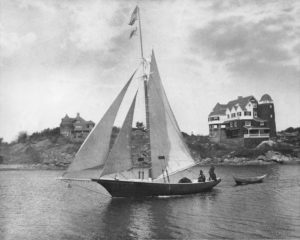 Their business catered to the popularity of yachting in Cape Ann and they soon became renowned for their sailing crafts. Four years later, White left to start his own boatyard with his younger brothers, Louis and Charlie. The White brothers began to focus more on service and repair of smaller sailing boats. In White’s absence, Fenton took on businessman Walter B. Calderwood as his new partner. Calderwood bought out Fenton soon afterward and moved his operations to a boatshed at the head of the inner harbor. The Calderwood Yard continued to build sleek yachts well into the 1930s. Days after the United States entered World War II in December 1941, the German navy, the Kriegsmarine, was authorized to unleash its prowling U-boats against Allied shipping convoys in the Atlantic. The Navy Department, woefully unprepared for war, moved to construct subchasers to defend its exposed vessels. There would eventually be 438 subchasers constructed nationwide between 1941 and 1944 to combat the U-boat menace. The Calderwood Yard received eight contracts between 1942 and 1944 to build wooden subchasers measuring a length of 110 feet. About 125 people were employed at Calderwood’s to build these boats. The White Boatyard, on the other hand, did not fare as well during the war; unlike Calderwood’s, the yard did not receive any naval commissions. In 1946, both boatyards underwent a change in management that shaped their identities to this day. Calderwood sold his business to Gordon Abbot Sr., a banker from Boston and a longtime summer resident of Manchester who had served aboard a minesweeper during the war. 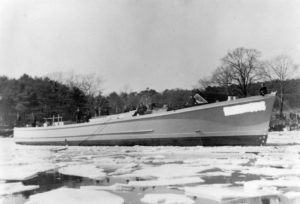 Shortly afterward, the boatyard underwent major renovations and was renamed the Manchester Marine and Construction Company, which began to focus more on service and repair. The former White Boatyard was purchased in 1946 by Sturgis Crocker, who had worked at the boatyard during the war. He turned the boatyard into a family business, establishing a partnership with his father, Sam Crocker, who was a naval architect. Soon thereafter, the business was renamed Crocker’s Boatyard and has remained in the Crocker family ever since. Today, the yard is owned and operated by Skip Crocker, Sturgis’s grandson. William H. Coolidge (Jr. – self proclaimed) was a very engaged Manchester citizen who passionately advocated for matters related to the harbor. Town selectmen consulted Coolidge, a former Finance Committee member, about many harbor-related matters, even the consideration of whether to approve a hot-dog stand opposite “the beauty spot” on Beach Street! 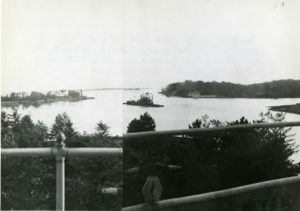 On June 29, 1927, Coolidge observed that Manchester was the only town in Massachusetts that maintained its own channel buoys; all others were maintained by the government. In October 1928, he alerted the Department of Commerce’s U.S. Coast and Geodetic Survey Field Station of the need for changes in the Coast Pilots’ publication to update the location of buoys in Manchester’s newly dredged channel. 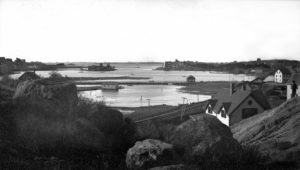 In 1938, Congressman Bates submitted a resolution with two plans to improve Manchester Harbor by a federally paid dredging of the harbor. 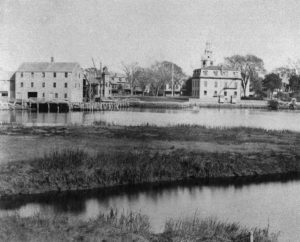 Until this time, the town and the Commonwealth of Massachusetts had covered all costs of Manchester’s dredging projects (except for $9,685.57 between 1897 and 1903). 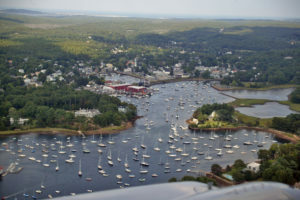 The town will construct, operate, and maintain pile and timber docking facilities for no fewer than 200 boats to be made available for use within five years. The town will construct no fewer than 50 spaces within one year of the federal improvement completion. The town will hold the United States free from all claims for dangers attributable to the work of the improvement. An August 13, 1940, letter from Coolidge to the War Department’s Board of Engineers for Rivers and Harbors stated that the town of Manchester would likely approve Plan B; however, he stood in strong opposition to the condition of providing boat stalls. He compared the provision to authorities building a road, with the stipulation that the landowner build a 200-car garage. Writing to Congressman George Bates, Coolidge described the requirement to build boat stalls as “outrageous” and recommended that Manchester and Congress reject it. Coolidge felt strongly that the citizens of Manchester could be trusted to make good decisions for the town without being committed to a five-year program. Abutters to the site of the proposed new marina also objected to its location and size because it would invade their privacy, and, upon landing, users would find themselves a mile away from stores. Two hundred boat stalls were considered excessive for the size of the harbor. Abutter Alexander Wheeler proposed an alternate location close to a town landing with fewer stalls (referred to as Wheeler’s proposal). By September 5, 1940, Bates urged Manchester residents to decide if they would officially object to the boat stalls and, if yes, to notify him so he could file Manchester’s protest. The townspeople were mindful that in this time of war, President Roosevelt was vetoing non-essential development of waterways unless necessary for national defense. 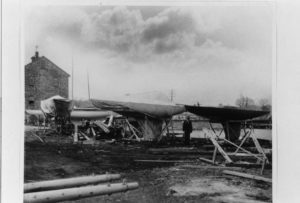 In response to Manchester’s protest, the April 1941 revised federal report called for a compromise of no fewer than 100 boat stalls, lowering the cost placed on the town of Manchester. Still strongly opposed to the requirement, Coolidge surmised that the In-Shore Patrol of the First Naval District might have persuaded the War Department that it needed this development as a subsidiary base in Manchester for small patrol craft, thus creating the requirement of boat stalls. A letter from Secretary of War Henry Stimson, dated November 21, 1941, reported that the project would not be in accord with the program of President Roosevelt at that time, making Manchester’s dredging project, paid for by the federal government, a moot point. In 1945, Congress established the project for the improvement of the harbor, but the federal government never performed any work. On June 8, 1967, the town’s Harbor Committee asked that this project be abandoned and a new study of the harbor be done. Manchester de-authorized its Federal Navigation Project designation, not wanting to be bound to federal rules. The town continues to pay for improvements and has been fortunate to receive state funding to supplement local funds.